And someone else celebrates by getting Chloe a person sized cake and a stripper. Yes I thought it was Lucifer too but it turns out it is Ella who helpfully hands out singles as well. Ella throws a good party. Chloe is, however, shocked and really hurt that Lucifer just run out on her on her birthday. I mean really hurt. Seriously when she asks if they’re leaving I felt genuinely bad for her. There they find a crime scene and Candy’s apparent dead body - though Lucifer realises it’s not Candy because Candy has hugantic feet and the corpse doesn’t. Ella is there to be awesome, provide crime scene skills and give Lucifer an alibi in case the police decide to look at him. She also thinks they should keep the whole fact that Candy isn’t dead quiet so whoeever did the murdering will, y’know, stop trying to murder. It also shows she’s had a difficult past in Vega, not just turning over casinos but apparently counting cards to quiet the voices in her head. There’s definitely more to Ella. 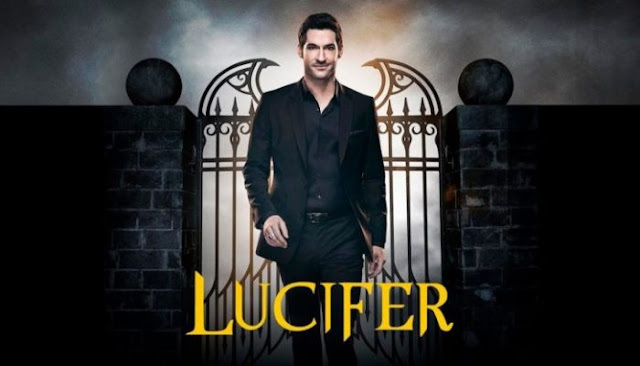 She also has careful insight into Lucifer - how he prides himself for honesty but his bluffs are just lies and how he’s totally avoiding Chloe. Eventually, with some more flashbacks, a dance number and finding the very much alive Candy and luring out the killer trying to steal and sell the club to pay his gambling debts (and ok, I’m not going to pretend to understand US law but I find it dubious that you can “own” land because you happen to own a piece of paper. The UK has gone waaaay past that and merely getting your hands on some deeds does not confer ownership of real estate; I find it… unlikely that the American legal system works this way). Lo Candy is saved, Ella shoots a girl in the leg and they can go home. Linda goes with. They find the penthouse deserted, Lucifer gone with his overnight bag which continues to concern Chloe. Linda insists they celebrate Chloe’s birthday and they realise they have awesome views, the best sound system and the best top shelf booze right there in Lucifer’s flat so why not party here? And you’ve got to love how Linda and Chloe kind of know that there’s no way Lucifer would object to them trashing the place for a party because he’s Lucifer and he’d totally be ok with that. While she does acknowledge overtly they came close to a romance she says they’re friends and feels she can’t be jealous and she isn’t jealous. And I don’t think she is - not romantically, not that Lucifer is with a one-night-stand or a fling: but I think she’s hurt that Lucifer, with his casual approach to his love life, considers a fling more important than her birthday. That he couldn’t wait a day, that he would hurt her or dismiss her this casually because they are supposed to be friends. Emotional and drunk she also talks about how Lucifer is keeping so much from her, how he never explains himself (because she doesn’t know the truth) and how this hurts her. And how even if he does have a good reason for leaving he’ll never tell her: it all her frustrations over Lucifer laid bare. Eventually they pass out drunk and Lucifer returns - amuse by the shenanigans and not even concerned they tried to break into his safe. Thinking Chloe is asleep he tells her why he went: that he had to help Candy but didn’t want to mention Vegas to her because last time he vanished to Vegas he hurt Chloe and didn’t want to remind her of that on her birthday. It’s sweet and silly and she seems to understand. Even when he gives her a gift of the bullet she shot him with on a necklace as a birthday present: it’s weird but it’s a very personal gift that only they would understand.